Wing construction is basically the same in all types of aircraft. Most modern aircraft have all metal wings, but many older aircraft had wood and fabric wings. Ailerons and flaps will be studied later in this chapter. To maintain its all-important aerodynamic shape, a wing must be designed and built to hold its shape even under extreme stress. Basically, the wing is a framework composed chiefly of spars, ribs, and (possibly) stringers (see figure 1-5). Spars are the main members of the wing. They extend lengthwise of the wing (crosswise of the fuselage). All the load carried by the wing is ultimately taken by the spars. In flight, the force of the air acts against the skin. From the skin, this force is transmitted to the ribs and then to the spars. Most wing structures have two spars, the front spar and the rear spar. The front spar is found near the leading edge while the rear spar is about two-thirds the distance to the trailing edge. Depending on the design of the flight loads, some of the all-metal wings have as many as five spars. In addition to the main spars, there is a short structural member which is called an aileron spar. The ribs are the parts of a wing which support the covering and provide the airfoil shape. These ribs are called forming ribs. and their primary purpose is to provide shape. Some may have an additional purpose of bearing flight stress, and these are called compression ribs. The most simple wing structures will be found on light civilian aircraft. High-stress types of military aircraft will have the most complex and strongest wing structure. Three systems are used to determine how wings are attached to the aircraft fuselage depending on the strength of a wing's internal structure. The strongest wing structure is the full cantilever which is attached directly to the fuselage and does not have any type of external, stress-bearing structures. The semi-cantilever usually has one, or perhaps two, supporting wires or struts attached to each wing and the fuselage. The externally braced wing is typical of the biplane (two wings placed one above the other) with its struts and flying and landing wires (see figure 1-6). In order to confer lateral stability to an aircraft, the wings may be angled upwards from the fuselage towards the wingtips. This is known as a dihedral. 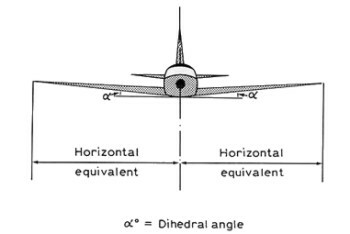 Some wings may be inclined the opposite way and this is called anhedral and allows aircraft to be very manoeuvrable, as is needed for military or aerobatic aircraft.